Born and raised in Los Angeles, California, Arch Thompson is a gifted flutist, composer/arranger and performer who uphold a rich and diverse musical tradition that extends from the shores of the Caribbean Islands and on to North, Central and South America. A serious student of music since the age of twelve, Arch attended Manual Arts High School in Los Angeles where he gained recognition for his creative and innovative style on the U. S. Army Band. He performed and toured internationally and studied at the U.S. Army Conservatory of Music. In the following years, he studied with Cheryl Grand, a former member of the Los Angeles Philharmonic and The Legendary Bill Green. He has toured extensively throughout the West Coast as a soloist. He later moved to Puerto Rico in order to fulfill his desire to master Contemporary Latin Jazz where he quickly became one of the featured Jazz flutist in the country and played with such notables as Dave Valentin, Jerry Gonzalez, Frank Lacy, Stefon Harris and Steve Turre. While in New York, Arch studied intensely with Harold Jones, a premiere flute instructor with the Manhatten School of Music and Arch continued to focus on his professional growth. 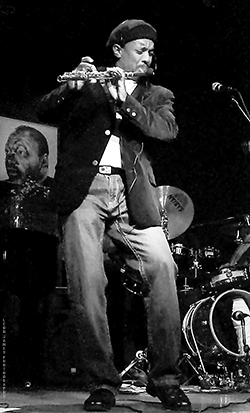 While studying and performing in New York, he began to synthesize his unique musical style, which blends classical, jazz, funk and Latin into a sensational sound that moves from the tranquil and beautiful to a driving, pulsing, rhythmic fire that will have you dancing and singing to the captivating call of the Flute. Arch believes that the Creator has provided him with a divine gift through which he can transform and heal all those individuals whom his music reaches. In his hands, the flute becomes an enchanting and magical instrument that purifies the mind and uplifts the spirit and is an experience that none should miss.